The Staten Island Advance published this article about the FHF Fun Station Event last month (4/2012). We did send them several photos but it seems like only one of them made it in. Photo Courtesy of Families Helping Families. 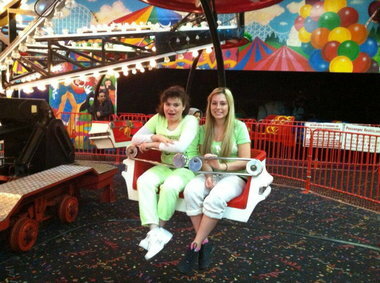 Felicia Alexander, left, and volunteer Kelly DePietro enjoy one of the rides at FunStation USA in Travis. TRAVIS — Special-needs children and their families took over FunStation USA a few weeks ago for a Family Fun Day filled with rides, laser tag, arcade games and lots of laughs. FunStation closed its doors to the public, but opened its arms to kids and families, allowing the children free run of the facility off Victory Boulevard in Travis. Both youngsters and parents enjoyed a fun-filled day in a safe environment, thanks to the supervision of staff and student volunteers from the not-for-profit, Families Helping Families (FHF), as well as FunStation USA staff. State Assemblyman Michael Cusick (D-Mid-Island) also dropped in on the festivities. FHF holds Family Fun Day events monthly, to complement the child advocacy, educational programs and support groups it provides for special-needs children and families in the tri-state area. For more information on the organization and events, contact fhf@fhfnyc.org, call 718-227-2171, or visit the FHF website at www.fhfnyc.org.